Summer: the season of swimsuits, sunscreen, ice cream, state fairs, outdoor movies, park picnics, umbrella drinks, bonfires, BBQ, trashy beach reads, and road trips. This year, Match.com celebrated summer by teaming up with travel planning platform Roadtrippers for a one-of-a-kind survey on the perks, perils, and pet peeves of road tripping with a romantic partner. Over 1,500 singles shared their insights on making it work (and the turn-offs that guarantee your automotive adventure will be a wreck). Nearly a third of singles (33%) agree that a road trip is a very significant milestone in a new relationship. But not all singles take it so seriously - an impressive 60% think it’s ok to attempt a road trip after just one month of dating a new partner. So picture this: you’re buckled up to Mr. or Ms. Maybe, a mere four weeks after your app-assisted meet cute, facing hours of one-on-one time that could make or break your budding relationship. How do you handle their lead foot and off-key radio singalongs? Keep your cool. Things can get heated when you hit bumps in the road. Be prepared for surprises. Stay calm and be flexible if your plans change. Eighty-three percent of singles agree that the biggest thing they hope to learn from their new partner is how they deal with unexpected situations, so handle potholes with a level head. Be adventurous. Make the most of your time on the road and try something new. Most singles want to have unique experiences while on a road trip -- like staying in a haunted hotel (47%) or sleeping in the car (41%). Show off your auto ingenuity. Flat tire? Don’t sweat it. Around 74% of singles say they can change a flat tire (96% men vs 51% women), and 45% of single women say it’s a turn-off if their partner can’t. The survey also revealed a number of don’ts for a successful road trip with a date. Both men and women say their top pet peeve is the way their partner drives (38%), followed by their choice in music (19%). They’re also turned off by long stretches of silence, road rage, and too many trips to the drive through. As for the single most surprising finding of the study, it’s this: 68% of singles would rather go #2 on the side of the road in front of their partner then pick up a hitchhiker. 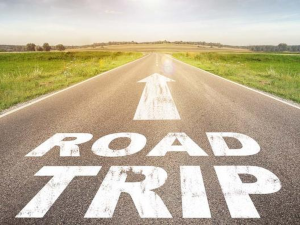 Take a look at the Match blog for more road trip tips and for more information about the dating service you can read our Match review.